Yellow, purple and raspberry—a combination of color and form so stunning that I wish I had thought of it! Actually, I did plant something very similar and there are a few interesting twists in replicating these blooms in your home garden. I photographed this labeled combination while out and about on one of my day trips around North Carolina and hope that my similar combination will look as lovely when mature. 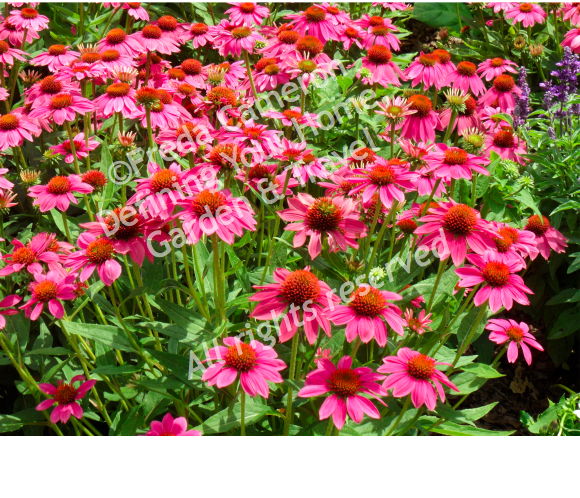 The echinacea, salvia and rudbeckia are all seed-grown plants. As such, the seeds may not always produce the plants to match the photo on the packets nor images you find in searching online. 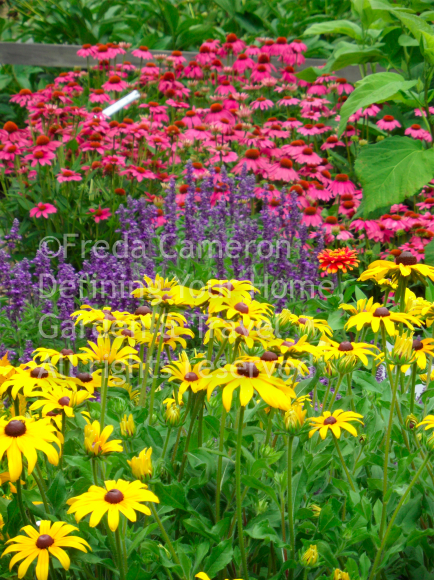 I am growing rudbeckia hirta 'Prairie Sun' with echinacea 'Pow Wow Wild Berry' and salvia farinacea 'Victoria (instead of 'Evolution' as shown in the photo). In my case, my 'Prairie Sun' blooms look just like those in the inspiration photo above—brown-eyed susans. My seed packet showed a green eye, instead of a brown eye. If you've grown 'Prairie Sun' from seeds, did you get the green eye or the brown eye? I'd love to know. At any rate, I still love these sunny plants, no matter what color the eyes! I cut these susans to bring indoors and the blooms last and last and last. These susans behave like annuals, such as zinnias. The more I cut, the more branching and blooms I get in the garden. The deer have nibbled a few blooms out in the garden. However, the plants have continued to produce lots of blooms and the deer are now ignoring the new flowers, so I'm not unhappy with the deer tolerance test. I've not noticed the rabbits eating these susans (and they love to eat the rudbeckia fulgida 'Goldsturm'). This rudbeckia variety is definitely drought-tolerant. I've not seen any wilting in the heat and I'm rating these as preferable over the fulgida type. The susans in the most direct sun have reached three feet before I cut them back. The ones in part shade have remained under two feet. The Goldfinch love to eat the seeds and I do expect considerable self-sowing. That's okay with me! I'm still waiting for my echinacea 'Pow Wow Wild Berry' to bloom as they were grown from seeds in a local greenhouse. Unless sown early, coneflowers tend to bloom in the second season when starting from seeds. The leaves on this echinacea are huge and rough compared to other varieties that I've tried—'Prairie Splendor', 'Ruby Star', 'White Swan', 'Sundown' and others. The deer and rabbits haven't eaten the leaves so far. Not a tall coneflower, it should stay around two feet in height. The 'Pow Wow Wild Berry' that I've seen in bloom are indeed impressive, so I have high hopes for similar blooms in 2012. My 'Prairie Splendor' in my cottage garden were under vole attack over the winter and I've been unable to find more plants, though I do have seedling replacements coming up for next year. I am hoping that 'Pow Wow Wild Berry' will be as wonderful as 'Prairie Splendor'. The salvia in the inspiration is 'Evolution', a perennial in warm zones of 9-11. I am growing salvia farinacea 'Victoria' that overwintered for me here in zone 7b from 2010. I have 'Victoria' growing in multiply locations in my garden—out in the open garden on the east, south and southwest as well as protected in a warmer microclimate in my cottage garden. The blooms on 'Victoria' are heavy in early summer, then after deadheading, I'm waiting for the second flush. In 2010, the 'Victoria' looked great in late summer and fall. The 'Victoria' have been reliably deer, rabbit and drought resistant in my garden. If the plant needs water, you'll know by the drooping leaves. The plant perks up quickly after watering. Whether or not you select the same varieties, I do believe this inspiration can easily be replicated in color and form with similar plants.